Now, let’s get back to “crazy.” For over 45 years I have asked myself the same question, “How the hell am I going to make it through another day? How do I find relief from mental and emotional anguish? I have so much energy, so much passion and yet I’ve been stymied in my search for peace, and wellness. Until one day, I came upon a possible solution. And that solution was to combine the two things that give me the greatest pleasure: trail running and landscape painting. Both are time consuming and require attention, so why not do them at the same time? So I did. And what’s really cool is that it works! Now, since I run to painting locations that are not accessible by a car or truck, it takes quite a bit of planning and effort, and a lot of materials and equipment. 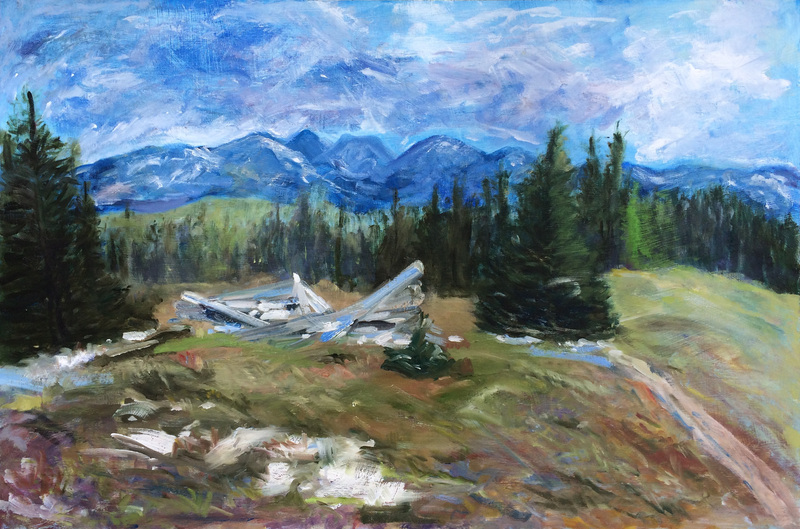 In addition to the combination of running and the painting, I film each adventure with basic cameras and a cell phone and then edit and post the videos once the painting from a particular trek has been completed. So here’s where you come in. I’m looking for support for materials such as paint, paint and more paint; and brushes, canvas, Masonite boards, foam core for transporting panels up and down the mountains and support to spend time of course, to paint. Additionally, in order to keep filming each trail run and paint session, I’m in need of more efficient filming equipment and editing software. The basic cameras that I use are very limited - having a small drone would not only provide panoramic aerial views but also cut down on the time it takes to run back and forth planting and then gathering my pocket video camera and iPhone. And at 13,000’ every step saved provides an additional brush stroke once I reach the painting destination. Your support will not only help so that I can continue to paint and share my work with you but, at the same time help to spread the word about what exercise and creativity can do to help others. You can contribute as much or as little as you like and you'll get plenty in return. From Patreon only posts, paint-alongs on Google-Hangouts to free art work! Please consider one of the different levels of *support campaign page or, contribute as much or as little as you like, and together, we can get closer to sharing beauty and obtaining excellent health one step, one run, one painting at a time. Thank you very much. I thank you from the bottom of my paint tubes to the end of my brush bristles! Gracias! 谢谢 Merci! תודה Danke! Takk skal du haありがとうございました Dank Je! *You can do a one time contribution by pledging your desired amount and then cancelling after you have paid and been charged. Monthly print shipped directly to you of either 8x19, 11x14 or 14x17 of signed, original artwork printed on fine archival paper. (Unframed from a Patreon only category of works. Contributing to this goal will allow me to purchase paint, brushes, large palette knives, canvas, masonite boards, and foam core for painting transport while running.